The violent overthrow of Salvador Allende on September 11, 1973 brought to a brutal close a thousand days of popular participation and radical democratic ferment. On September 11, 1973, the Chilean military — led by Augusto Pinochet and supported by the United States — overthrew the democratically elected government of Salvador Allende. The seventeen years of dictatorship that followed were brutal. And they’ve managed to erase much of the historical memory about what came before them — that is, what took place during those three years of Allende’s Popular Unity government. In her new book, Beyond the Vanguard: Everyday Revolutionaries in Allende’s Chile, historian Marian Schlotterbeck brings to life the spirit of popular revolution that characterized the thousand days of Allende’s government. While the Popular Unity government often preached moderation, it unleashed radical changes from the bottom up — raising the hopes of the historically oppressed that society could be remade for their benefit rather than the “Yankee imperialists” or traditional landed elite. The September 11 coup crushed those popular democratic dreams. In the following interview — which has been condensed and edited for clarity, and first appeared on the radio program Against the Grain — Sasha Lilley speaks with Schlotterbeck about Chile’s three-year experiment with a socialism that was both top-down and bottom-up. What were the currents of the traditional left in Chile? Starting in the late nineteenth century, Chile had a very strong labor movement that came out of the northern nitrate mines and the southern textile and coal mining communities, and that militant leftist labor movement allied itself to the emergent political parties that represented the working class: the Communist Party and the Socialist Party. Across the twentieth century, the goal of those two parties was to take state power through engaging in electoral politics. And that’s what Allende’s victory represented in 1970. It might have shocked the world, but it was part of a decades-long strategy by the Left in Chile to take power through peaceful means. Chile was regarded as a more middle-class country than some in Latin America. What did Chilean society look like, and what were the forces politically, economically, and socially? Chilean politics typically broke down into what were called “the three thirds.” There was the Right, there was the center (represented by the Christian Democratic Party), and the Left (represented primarily by the Socialist and Communist Party as well as the smaller leftist factions). Chile had a fairly large urban population, largely concentrated around Santiago, the capital, and the industrial port cities of Valparaíso and Concepcion. While industrial workers had gained significant political rights in the 1930s, rural workers had been systematically excluded from those same rights to unionize and organize. That started to change in the 1960s as Chile’s political system opened up to include more actors. Eduardo Frei started carrying out a series of progressive but still relatively moderate reforms. Things like land distribution, which really had not been touched in Chile since independence in the early nineteenth century. For a lot of the traditional landed elites in Chile, that agrarian reform in the sixties was the beginning of the end. Allende’s election was just one more step. As much as the Frei government wanted to carry out a very moderate transformation of Chilean society, they also raised expectations. And they weren’t able to meet those rising expectations, both from rural peasants as well as from the urban homeless poor, who were engaged in a series of shantytown land occupations. How did the Right and the traditional elites respond to these reforms? One key element of Chilean history is the extent to which there’s an authoritarian right that doesn’t believe in democracy at all. When its back is up against the wall, it’s going to turn to force, to violent repression, to maintain its hold on power. For example, landowners started to arm themselves to take back or defend their land from being expropriated or occupied by peasants. Allende didn’t come out of the blue when he was elected in September of 1970. Who backed him, and what parties came into coalition behind him? Allende led the Popular Unity coalition, which was composed of the two largest parties, the Communist Party and the Socialist Party, as well as smaller leftist parties. Allende’s election represented a victory for workers and for the working class — the non-elite, popular sectors of Chile. They saw his victory as their own. There had been a massive groundswell of popular support for Allende beginning in the 1960s. Chilean society in the 1960s experienced a number of different social movements, from the peasants’ movement to the shantytown movement to a very active university-reform student movement. So you see the ways in which society is mobilizing, and that brings Allende into power. It wasn’t that his election suddenly overnight inspired all these people to mobilize and demand more of their government and to begin carrying out transformations on their own. It’s the reverse: the movement is what made possible Allende’s electoral victory in 1970. What did Allende campaign on? What was his agenda? Allende promised a peaceful revolution through the ballot box. He promised to redistribute wealth. He wanted to end foreign control as well as monopoly control over the Chilean economy. And he wanted to deepen democracy by extending things like worker participation in factories. How did his coalition come together? Was it a kind of motley crew, or different entities with a pretty similar vision? Chilean party politics, throughout the twentieth century, was built around forming coalitions. In the 1930s and 1940s, Chile had a number of successful Popular Front coalition governments, and in some ways, Allende’s Popular Unity was just a reconstituted version of what the Chilean left had been doing all along. That said, because it wasn’t a single party, there were of course differences between the Socialists and the Communists. There were differences between those inside and outside Allende’s governing coalition, particularly critics from the Left. Tell us about the far left. For a long time, the dominant model in Latin America was armed struggle to overthrow the state. Was there a revolutionary left in Chile that was trying to go the Cuban route? Yes. In 1965, the Movement of the Revolutionary Left [MIR] was founded by dissidents from the Communist and Socialist parties. They drew inspiration from the model of the Cuban Revolution, but they also drew on Chile’s much longer tradition of anarchism and labor activism. The MIR in its early phase was a motley crew of this older generation of dissidents from the 1930s and a young generation of rebellious youth in the universities who participated actively in the reform movement. In the 1960s, with the Christian Democrats in power, the MIR did support armed struggle. They said, “We’ve looked at the models. Look how many times Allende’s run for office, and he never wins. Why are we going to keep supporting this same old, tired strategy?” What really changed for Chile’s revolutionary left was Allende’s election, because suddenly it opened up the possibility for effervescent grassroots social struggle. Allende was often called the compañero president. He promised that unlike in the past, state force was no longer going to be used to repress people. A lot of different sectors of society saw this as a green light to go forward with their vision for change because the president was behind them. Things were going to be different from before, where so often the police and the military had come in to break strikes and to forcibly evict people from squatter settlements. What did those thousand days of Allende’s Popular Unity government look like on the ground? How much was changed or altered? So often we talk about “capital R” revolution — the seizing of state power, that’s when the revolution happens. But there’s so many ways in which there were smaller transformations: people stood up to the boss for the first time, people organized their neighbors and collectively carried out an action to occupy land and started building their homes and building a new community. These are really radical transformations in the ways in which people conceive of themselves, in the ways in which they conceive of their place in society. What happened in Chile was what I call “everyday revolutions” — transformations in how people saw their place in society, and saw an opening to act. In some ways I think these smaller scale transformations are a lot less threatening than that specter of armed insurrection, than the bearded ones in the mountains or the scruffy college students building bombs in the cities. These are the images that we often think of when we imagine Latin American revolutionaries. But as people came together to try to transform their daily realities, those transformations challenged the status quo, challenged the de facto powers that had been held by the traditional landed elite in Chile. And so they were a threat to the status quo — they were claiming a life with greater dignity, a life in which they felt like equals in society. What relationship did the MIR have to the Popular Unity government, and how did it involve itself in these everyday transformations that you’ve just alluded to? The MIR never joined Allende’s Popular Unity coalition (although one of their national leaders, Andrés Pascal Allende, was Allende’s nephew, so there was a close personal connection and communication). Typically the MIR was painted as the extremist left that was a thorn in the side of Allende. Part of what my book, Beyond the Vanguard, looks at is the ways in which the MIR was more of an ally to the struggle — more of an ally in the sense of trying to work alongside these popular sectors. There were times, quite paradoxically, where the MIR was called in to try to contain demands, to try to channel them more in line with Allende’s new housing policy or more in line with his new agrarian policy rather than just stimulating greater and greater actions with no regard for the impact they would have on his ability to govern. Because they were part of demands for moving more quickly, seizing land and pushing changes faster, is that right? Yes, that’s right. A classic debate about revolution is how fast you go. Do you move as quickly as possible and try to consolidate your hold on power by consolidating those revolutionary changes, or do you go step by step? Allende was very much committed to working within Chile’s institutional system, working within Chile’s constitution, and at a certain point there was a contradiction, because the constitution was not written to benefit the working class. It was a document built to reinforce the power of those who already had it. And so part of what the Chilean experiment with socialism illustrates are the real limits of liberal capitalist democracy to respond to people’s needs. What happens when more and more people have a stake in the process and they want to demand something of it? To what extent can a liberal democratic system open up and be responsive? And what’s the breaking point? You studied the city of Concepción, where workers threw themselves into this process to challenge the powers that be. What forces of reaction were apparent there and elsewhere in the country? The first year Allende was in power, his government was quite successful at carrying out its policies, and the opposition was not particularly vocal. But starting in 1972 they launched what was called the “Boss’s Lockout.” This was part of a strategy to bring the Chilean economy to a standstill. Now, thanks to the National Security Archive in Washington, D.C., we have all of the documents detailing the US government’s role in promoting this policy — the direct order from Richard Nixon to “make the economy scream” that was given within days of Allende being elected in September 1970. One of the classic memories, or images, of the Allende years is waiting in line, of there not being sugar, of there not being oil, of there being rationing and shortages for basic consumer goods. A lot of those shortages, as we now know, were artificially created. Shopkeepers decided to take products off the shelf and sell them at higher profits on the black market rather than meet the growing consumer demand that Allende had created through his policies. One of the iconic images of the Allende years was in one of these lines: a worker has a large poster that says, “Under this government, I have to wait in a line, but I support this government because it’s mine.” People were aware that the opposition to Allende’s government was what was undermining him — not his own incompetence, not the Left’s own incompetence. Yes, there were inefficiencies and challenges, but it really was the concerted effort by the economic and political forces opposed to Allende (alongside the military and the different actions by the US government) that were effectively blocking Allende’s ability to carry out his policies the way that he had promised. What was the sense at the time of the degree to which the US was involving itself in undermining Allende’s government? I think most people knew, and part of this was because a scandal broke in 1972 that the Chilean subsidiary of ITT had lobbied the CIA to intervene and fund different renegade military factions in Chile to try to keep Allende out of office during that brief two-month window between when he was elected in September of 1970 and when he would be sworn in, in November 1970. So it was fairly common knowledge that despite the public declarations by the White House that they were neutral towards Chile or that they had no official oppositional stance to him, behind the scenes, the CIA as well as the White House were actively opposed to Allende. I wanted to ask you more about the transformations that people tried to enact during this period, especially as it relates to popular democracy. Can you describe some examples of what this looked like? In Concepción, the industrial southern city, there was a long tradition of participatory democracy. For example, student politics at the University of Concepcion were driven by an assembly-based model, and in the late 1960s there was a massive university reform movement. That’s part of what catapulted the MIR onto the national scene. There’s a similar kind of participatory democratic practice in the shantytown movement. Urban homeless poor would form committees, they would debate what possibilities existed to squat on unoccupied lands. Months of planning would go into one of these massive urban land takeovers, and then they’d be governed by a general assembly of pobladores, of the urban poor. So there are different kinds of participatory democratic practices that existed in the region and in this moment of Allende’s government, there was an effort to really scale those up to the regional level. One of the chapters in the book details the Concepción People’s Assembly, which took place in July 1972 and was an effort to allow a space for grassroots social leaders as well as party activists to come together and debate what future path the revolution should go down. One of the things that you explore in your book — and the title of your book speaks to this — is that the MIR, which was playing an important role in a lot of this grassroots upheaval, was ideologically a very top-down, Leninist organization. Yet despite that ideology and the self-projection of the organization, you argue that its practice turned out to be much more complex. How so? I think it was almost in spite of its Marxist-Leninist ideology that the MIR succeeded, and that has a lot to do with this tradition of a leftist working-class culture in Concepción. Part of what made the MIR successful were the local people on the ground who joined its ranks. Often the MIR and other revolutionary left groups in Latin America got written off as fringy student groups that just wanted to debate ideology — they’re all talk and no action. Part of what makes Chile’s revolutionary left under Allende such an interesting case study is that it was more than just talk. It really became, at least in the southern industrial province of Concepción, a grassroots movement for revolution instead of just a top-down vanguard. How did that movement and allied movements respond to the mounting forces of reaction? And how was Allende countering them? At the grassroots, there was a strong demand to just go out and stop these actions like the Bosses’ Lockout, particularly in Concepción, where the left was numerically the majority. They said, “The Right can go march all they want in the streets of Santiago, but not here in Concepción.” And so we see examples of people going out and occupying a bakery and saying that the bakery needs to produce good bread for everyone — not just selling the higher quality bread at higher prices to the people in the cities, but to actually make it accessible to the coal miners and their families in the town where this bakery was located. Allende has a much harder time, because he’s governing. He has to find a way out of this stalemate. The more radical leftist sectors of his coalition said, “Throw your weight behind these grassroots movements.” Other sectors of the Communist Party, which was much more moderate, said, “It’s time to keep trying to negotiate with the middle, keep negotiating with the Christian Democrats, negotiate a political solution out of this.” So Allende actually brings in two military figures into his cabinet as part of the negotiated exit from the stalemate over the 1972 Bosses’ Lockout. Part of the challenge for Allende was that the center increasingly wasn’t there. The center had moved closer and closer to the Right, and eventually the Christian Democrats, the majority of the party, threw their support behind the authoritarian right and a military solution. Allende’s government was overthrown on September 11, 1973. In the months leading up to that, was it apparent that such an authoritarian solution was in the offing? Many people thought a coup was coming. 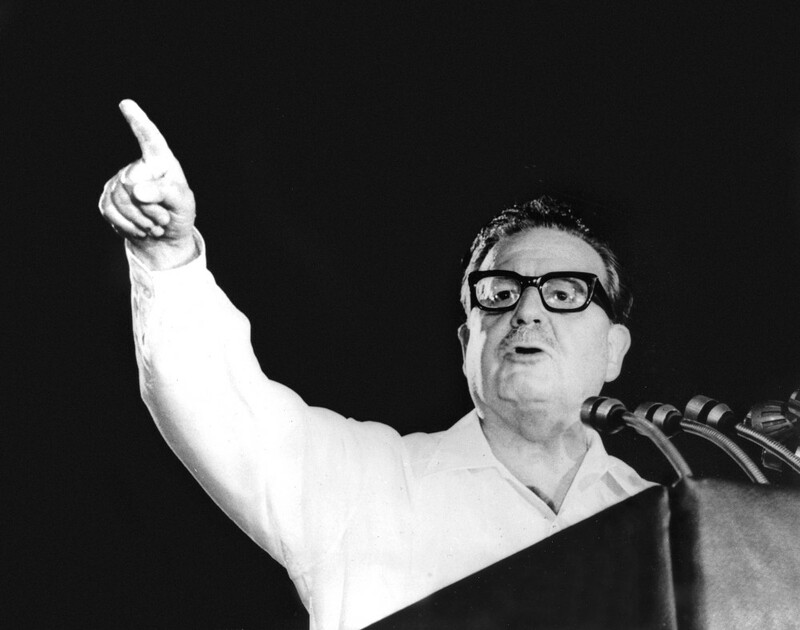 It seemed apparent that Allende was not going to be able to finish his six-year term. But I think very few Chileans had any sense of just how violent and brutal the military repression would be. Violence was unleashed not just against Allende and members of his government, but against all those sectors of society — the workers, the peasants, the mother centers, the shantytown residents, the students — who had mobilized to support Allende but also just mobilized to be a part of society, to be an active force in a broader democratization of Chilean political life. I think the level of violence also meant that many Chileans started to believe some of the narratives that the regime propagated about why this was necessary. People needed a narrative to make sense of why this was happening, and so with time they started to believe that some of these leftist groups hadn’t just been the local schoolteacher or the local mayor or the baker, they’d actually been part of these subversive terrorist elements. That culture of fear really worked its way into the fabric of Chilean society during seventeen years of military dictatorship. Chile’s dictatorship lasted much longer than most of the other military dictatorships in power in South America at this time. It appears that part of Pinochet’s agenda was to rewrite history and to obliterate the memory of the Popular Unity government and the leftist grassroots movements that had supported it — partly by killing the revolutionaries who had been involved, but also by rewriting history to put the blame on the organization that you’ve been talking about, the MIR. The argument being that they pushed Allende too much to the left and very bad things happened, which really needs to be laid at their feet. Looking back, how do you assess that claim that the revolutionary left movement was to blame? I think those narratives are much more about justifying political repression and justifying the ongoing effects of economic austerity. Part of why I was motivated to do this project was to look at this group in Chile that had been scapegoated during the dictatorship and well into the 1990s and the 2000s. This was not seen as a group that was worth studying or that it was safe to talk about, because for so long, people had had to keep their participation a secret. So part of what I see this book as doing is opening up the opportunity for these grassroots activists to talk about what they saw as their project. What had motivated them to join this movement? And to let the readers decide for themselves what kind of a threat they posed to society. What lessons did the Latin American left take away from the crushing of this electoral revolution, if we can call it that? Do you think that it reinforced the notion that armed struggle was the only way? It certainly does if you look at Central America in the seventies and the eighties. The problem posed by the Chilean experience is, how do you work with an opposition that’s not willing to play by the rules of the democratic game? Of all the criticisms that people could make of Allende, he was really the true democrat. It also speaks to the tensions between the relationship between social movements and political parties. To what extent are political parties coopting and controlling social movements? To what extent can social movements remain outside of institutional channels and be effective at pressuring and changing the conversation more broadly within a society? The military takeover didn’t resolve those questions. It simply repressed them. Let me end by asking you about continuity and rupture. In 2011 there was a mass movement that broke out in Chile populated by students and others that denounced neoliberal austerity. One of the things that’s striking in reading Beyond the Vanguard is the ways that past movements feed into future ones throughout Chile’s history — so the popular militancy of the thirties and forties lives on in later movements in the sixties. But then you have a moment — and it’s not just a moment, it lasts seventeen years — of tremendous rupture, of an attempt to erase all memory or to rewrite history altogether, and so people who are involved in the movements of the early seventies on the Left are fearful to even mention that history and discuss it. You were in Chile in 2011 when this mass upsurge happened. How did that movement relate to the history that you’ve written about, of the thousand days of the Allende Popular Unity government? The student movement of 2011 responded to neoliberal austerity measures and the privatization of education during the dictatorship. Often this generation of young people in Chile is called “the generation without fear,” because they were born after 1990, after the end of dictatorship. In their repertoire of creative protest tactics — of occupying the streets and their schools — you saw a return to political mobilization as centered around joy and liberation. And that taps into this deeper historical memory of what everyday Chileans experienced in that thousand days of revolution — that feeling of making history, of being part of a broader movement. So I think there are clear parallels in terms of scale and effervescence and the desire to seek out new forms of political action that bridge the sixties generation with the contemporary student movement today. Marian Schlotterbeck is assistant professor of history at the University of California-Davis and the author of Beyond the Vanguard: Everyday Revolutionaries in Allende’s Chile. .
Sasha Lilley is the co-host and co-producer of Against the Grain, the author of Capital and Its Discontents: Conversations with Radical Thinkers in a Time of Tumult , and co-author of Catastrophism: The Apocalyptic Politics of Collapse and Rebirth .